Many things have been/are getting hijacked, and I am not saying that this is one of the really important ones but it has pissed me off on a couple of occasions in the past few years that I think it’s about time someone points out how many things are being sort of sold out indirectly within our private sector. A few years ago, I wanted to intern at a local magazine, and thinking that JO was one of the strongest I sent them to inquire about the issue. I was told that I needed to have a journalism background or experience, which was somehow the point of me asking for that internship. 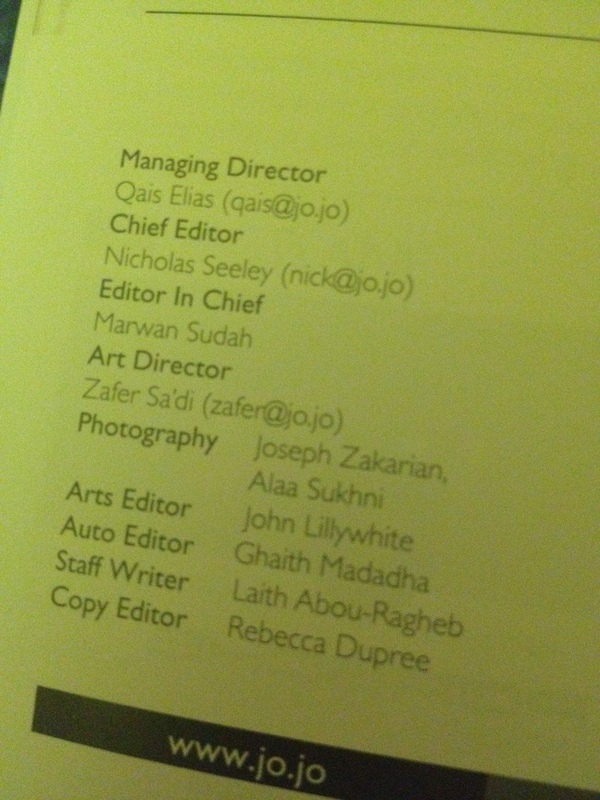 I did not push or follow up, but you can see from the following few pictures from different JO issues from this year and last year that their editor in chief has almost always been a foreigner with many foreign contributors and interns. Interns who for the most part are foreigners residing in Jordan for a while as they study Arabic or volunteer with the peace corps or any other organization, many with no background or experience in journalism, their only advantage is being fluent in English. It’s becoming a pattern, half of the names are foreign. It has not only become an industry easy for them to infiltrate and find a job at, they also get a priority over any local. I afterwards went to intern at Al-Faridah, with Viva magazine, Trendesign magazine and Layalina magazine which came with the package. An American intern was allowed to write pieces while I went to pick up items to be photographed; searched for images of dresses and the likes and on occasion wrote some of the horoscopes and a ‘kitchen talk’. The editor in chief at Viva and Trendesign was an American, the other English writer was a Jordanian who needed help writing in Arabic and transferring data from a recorded interview she made in Arabic into written text and translating it into English. The following pictures are from different GO magazine issues this year and last year as well. 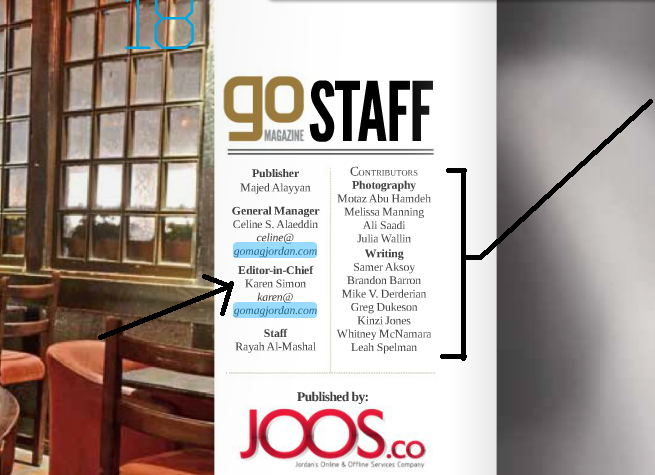 Go magazine defines itself as the “go to monthly guide for what’s going on in Jordan”. It shows almost the same model of foreign names taking over. I am not saying that they don’t do a good job, but why is it that foreigners lead such magazines, isn’t it possible that locals might just know a bit more about Jordan than expats? How hard is it to find a Jordanian with good English and local roots that can really let you know about Jordan? What really got on my nerves this week was seeing this in Akhtaboot, Al-Faridah’s English editor post is for those who graduated from US or British universities only! 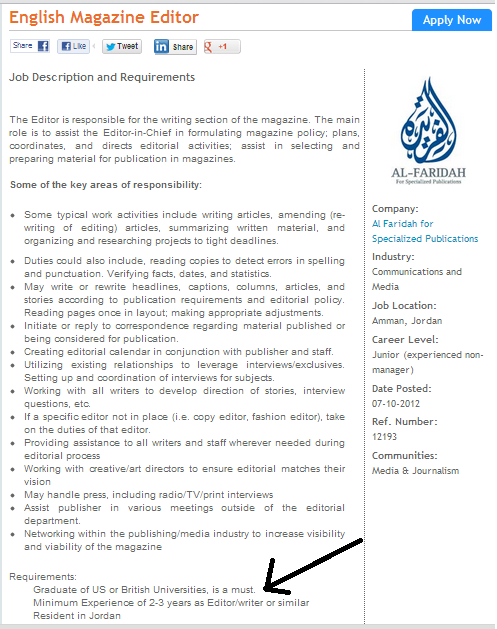 So basically someone who has spent the past 4 years of their life outside of the country studying is the best candidate for a Jordanian magazine! Bottom line is, if you’re an expat or a graduate from a foreign university, even if you studied sports or law or anything at all, you’re always a better candidate than any Jordanian can be! I simply cannot make any sense of it! What to do? 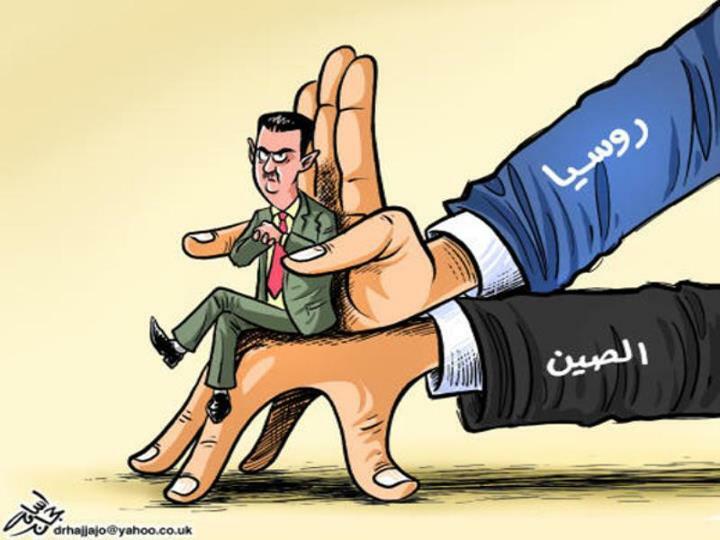 The charges vary between what translates to “tearing down and weakening the Jordanian regime”, ”illegal assembly”, ”attempting to change the constitution”, ”inciting regional feuds” and a few others. Charges that I personally find much more reasonable to accuse the regime and government of rather than these men, as we citizens can barely tear down a wall without getting an approval from some governmental entity let alone have the strength to tear down the regime by simply ‘speaking’. The retardation portrayed in arresting people for simply speaking surprises me, but is most understandable! Most of those detained,with all due respect to their work and determination were simply protesters, they were not working on major action plans with anything that can seriously threaten the country. An expression a fellow column writer expressed his surprise at such charges by wondering whether our regime is so brittle and cardboard-like that it feels that it is weakened and being torn down by a few words in a video or over a loudspeaker at a demonstration. They should feel that they’re being undermined and threatened by the change in mentality and by a huge dose of courage, but certainly not feel threatened by a group that came together as a reaction to the governments’ and regime’s actions as opposed to a group that came together to actively act. Having said that, one has to mention the lack of knowledge we have on a collective survival approach. Our work and movements are pushing forward names to the forefront of our media and gossip sessions and creating ‘stars’. I’m not sure how to express this well, but we aim to get out of our bubble to just go into another, another bubble with maybe less people in it, only a more transparent one, so that people in all the other surrounding bubbles can see us. Those who can’t see us because of being in a distant bubble can hear us screaming in the distance. As much as we think we’re being effective with this approach, I’m not sure we are.A real collective effort is truly due at this stage, and I am quite aware that none of us have the answers or the methods. We’ve been brought up well to walk the path of individual escape, most of us don’t know what sacrifice tastes like, sacrifice that is devoid of ego boosts and indirect paybacks, real sacrifice that leaves you with nothing. I can simply quote articles 7 and 15 from our constitution and tell you that we can lean on them, but as one dear person discusses with me constantly, constitutions count in real sovereign countries, not in ours. 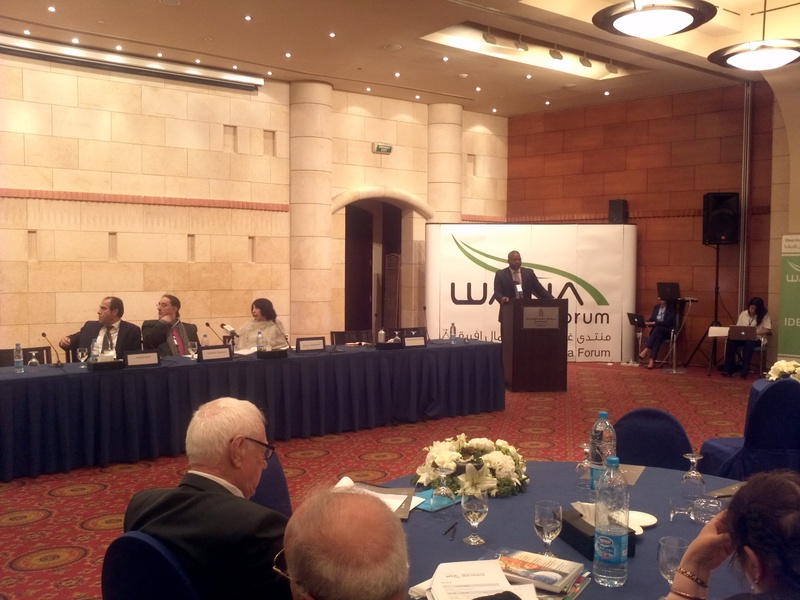 The 4th WANA Forum took place on the 29th and 30th of May-2012. The theme: Identity. My skeptical persona shines brighter than ever at times like these and I like to see what things are all about. The event had several panels on Identity and several sessions from “Region in transition and the concept of identity” to “Identity and religion” , “Identity and social cohesion”, “Multi-layered identity”, “Identity and the environment” and a few others. The speakers were from all over the world as were the 150 attendees whom stayed at the Kempinski for the duration of the forum. 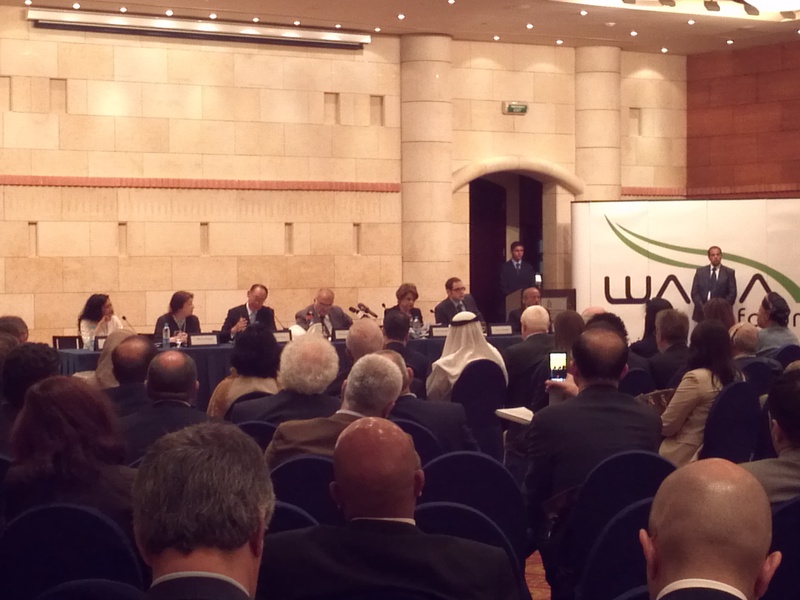 The familiar faces were very few, Prince Hassan Bin Talal (Chairman of the Forum), the all too precious Munir Fasheh, Aroub Soubh, Dima Khatib and Raghda Butros. 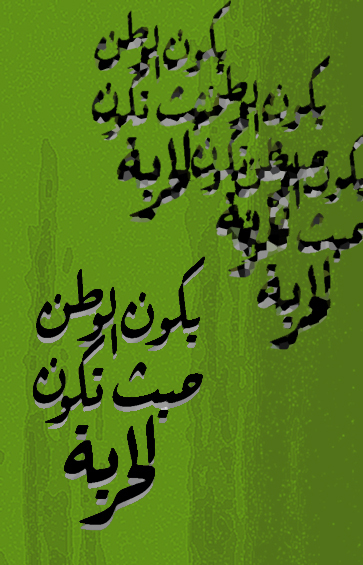 Other than that, to me and I suppose most of us here in Jordan, the rest of the faces and names were very foreign and new. People from Taiwan, Tajikistan, The Netherlands, Nigeria, Malaysia, Bangladesh and a few other countries where speakers. They do not represent the West Asia and the North Africa region the Forum is entirely about, nor do they relate in any way to ‘our’ identity. I’m not sure to what identity the forum was entirely about because it was not in Arabic either. Many Egyptian, Jordanian, Lebanese and in general Arab speakers spoke in English although there was live translation for foreigners and as far as I recall only 3 speakers insisted on speaking in Arabic connecting their language to their identity. I’m not personally one that is too hung up on the language issue (Hello, i’m writing in English) but I found it a bit interesting that a forum on identity took place when the only things that were identity related were the couple of Indian sari’s, the Omani dishdasha and a Palestinian embroidered dress the attendees/speakers wore. The event was closed to mostly international invited high profile/active individuals from the public, private and civil society sectors around the entire world. The talks were very varied, many were mostly introduction pieces about the area/background the speaker was from and were mainly not too deep or related to the idea of identity but to the identity of the speakers themselves. I personally expected things to be more on an intellectual level than on an introductory level between different backgrounds. One of the talks I found most interesting was that of ArabNet founder Omar Christidis on “Identity and social communication”, who went through several quotes that introduced perspectives on identity related issues. He mentioned transitions in identity, how some movements/events challenge our identity and turn us from mere observers or an audience to an agent of change in which identity is redefined into something that we sense we belong to considering we took part in its creation. He talked about altered expectations and about events that get mixed up with their own causes and get linked over time and space to create shared narratives and stories, and eventually identities. He mentioned the ‘arab spring’ but his talk unlike many others did not speak about him or his experience but more about his thoughts which was certainly admirable. Another was Munir Fasheh’s talk entitled “Identity: A modern invention.” Fasheh connected Identity to our knowledge about ourselves and our lives and to the wisdom gained through our daily life and interactions and not from talks and discussions and dialogue on identity itself. In the war of حوار vs. جوار Fasheh repeats in many of his talks, ‘jiwar’ or neighboring wins every single time over good old dialogue -the concept of the forum itself. Lebanese Ziad El-Sayegh was one of the most well ordered and straight to the point speakers. He also separated his talk from his own background and story. He talked about “The minority illusion”, how being a minority is more about mentality and perception than about truth and facts. “The distention of the majority”, when the majority ensures its right at full governance and the exclusion of any partnership or pluralism. “The sagging of the Liberals” and “The fragility of social, economic and political justice.” His talk concentrated on the civil state, values and citizenship as an identity. Kurdish Bakhtiar Amin from Iran talked about “The Kurdish Identity: From Denial to Digitalization.” His talk indirectly made it clear that our identity as Arabs is a collage that is very hard to break apart even if we take it down to the mere geographical factor disregarding everything else. Many other speakers talked about their mixed identities, others considered themselves to sort of be citizens of the world, another group shed some light on certain -mostly negative- experiences that were caused by their identities and it seemed to me like all talks portrayed how complex it is to find a definition or a measure for Identity. On a personal level, I found it interesting to interact with and listen to people from across the world, but I failed to see the point, I failed to understand who is targeted with such an event, did the audience really learn anything new? What are the outcomes? How have these random and no so well structured talks helped us find ourselves or move forward at such a critical time. The forum carries itself as an event that facilitates debate and the exchange of ideas whilst the attendees were all from sectors that are well aware of most of the not too deep issues that were brought up throughout the 2 days. The youth were for the most part excluded from the event, the chairman barely stuck around to listen to the speakers and the general atmosphere during the talks was somewhat boring and monotonous. I’ve come out with a few things to play around with in my head about identity, but the question that remains is how long will we continue on this road of dialogue about things that can not be discussed deeply at this level nor will really give us any push towards actively rising with our communities? If events that directly come from the royal palaces with endless resources and capabilities for real change are sticking to dialogue then what are we commoners to do? My out of the box posts can still be received in your inbox you know! Got Twitter? What are you waiting for then?